Last year we were fortunate enough to be invited to The Calgary Opera’s closing gala for their production of Madame Butterfly at the Southern Alberta Jubilee Auditorium for a Japanese-themed evening with lots of cultural entertainment. To kick off the main portion of the event, we invited the guests into the auditorium with the sounds of our drums where we treated everyone to a Japanese drumming performance. The atmosphere was festive and intimate and everyone had a wonderful time. 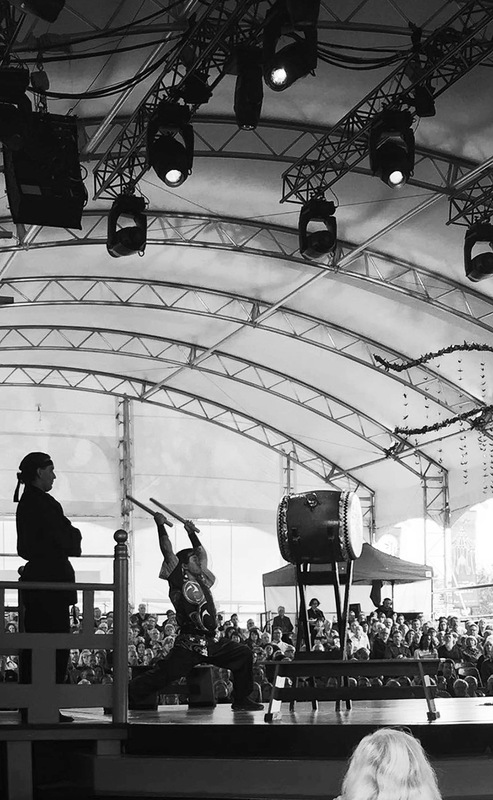 This year we have been invited once again to be a part of the Calgary Opera’s production of Gilbert & Sullivan’s The Mikado, which is part of the Opera in the Village event held outdoors each year in the East Village. We will be performing for 4 of the 8 days in their outside pavilion to provide free entertainment to the guests before they enter the show. Look for us on the Second Stage where we will be putting on 20-minute performances on August 13, 15, 20 and 21, 2015. We will also be performing briefly at the beginning of each performance as special guests of part of the production of The Mikado! 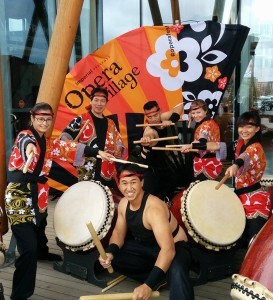 Each evening, from August 13-22, there will be a Midnight Taiko member onstage performing alongside the orchestra as part of The Mikado Overture. We are excited to have authentic Taiko drumming as part of the production, make sure to watch for us if you are attending the show. We hope to see you there! For more information about Opera in the Village or to purchase tickets to The Mikado, visit the Calgary Opera’s website.